Last week, it was reported that a senior scientist at Google, Jack Poulson did the right thing and resigned from his high-paying job over his employer’s decision to support censorship in China. “I am forced to resign in order to avoid contributing to, or profiting from, the erosion of protection for dissidents,” he said. The senior scientist blew the whistle last month after the Intercept revealed through leaked documents that the internet behemoth planned to launch a censored version of its search engine in Chine that will blacklist websites and search terms about human rights, democracy, religion, and peaceful protest. After unsuccessfully pleading with his bosses to stop the implementation of this censorship platform Google is creating, Poulson tendered his resignation. He felt it was his “ethical responsibility to resign in protest of the forfeiture of our public human rights commitments,” he said. The insidious nature of supporting such tyrannical censorship speaks for itself. However, Google apparently couldn’t care less about the implications and are reportedly moving forward with the initiative anyway. What the hell happened to “don’t be evil” Google? Through their censorship tactics, Google is helping to enable one of the most tyrannical and oppressive regimes on the planet. According to the leak, Google’s Chinese search app will automatically identify and filter websites blocked by the Great Firewall. When a person carries out a search, banned websites will be removed from the first page of results, and a disclaimer will be displayed stating that “some results may have been removed due to statutory requirements.” Examples cited in the documents of websites that will be subject to the censorship include those of British news broadcaster BBC and the online encyclopedia Wikipedia. What’s more, Google will likely be required to turn over these blocked results to the Chinese government, in turn becoming a policing arm of the tyrannical state. This move by Google to not only support censorship, but participate in the oppression of more than a billion people should not be taken lightly. The internet giant is actively working with a corrupt and murderous government to allow that government to continue its corruption and murder—unchecked and under cover. Based on the history of how China treats its dissidents, Google could soon be complicit in the murder of people for their political views. Let that sink it. While this censorship by Google may be currently reserved for China, it’s only a matter of time before the tyrants in America seek to adopt it here—in the name of “national security,” no doubt. While many Americans may be oblivious to the horrific nature of the Chinese surveillance and police state, the reality is that it exists and is getting worse. In fact, the level of tyranny has become so problematic that even mainstream media is occasionally forced to report on it. Below is a clip from a Wall Street Journal report on what they called the “total surveillance state” in the country. 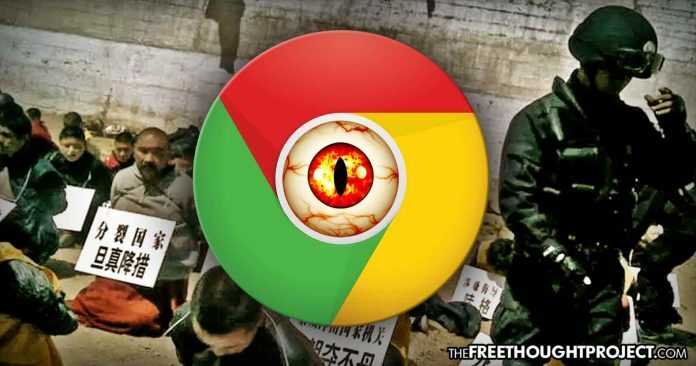 If you want a glimpse into what Google is supporting, below are more short videos exposing the horrific nature of the Chinese government—one that Ingsoc would be jealous of.